Regular burials require vault and cremation burials require a minimum of hard plastic outer container. 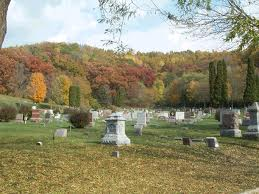 To locate a family member in the Richland Center Cemetery, click here. To locate a family member in the Bowen Cemetery, click here. The following are prohibited in the Cemetery: snowmobiles, dogs, cats, horses and all glass items. During the mowing season: All decorations/flowers may be placed either in a concrete urn on the ground or up in an urn on a pipe type stand. Prohibited items will be placed near upper flagpole for pick up. Flowers/decorations are prohibited on the ground. Urn stands must be of the single pipe variety (no tripod stands). Only two urns per lot. Lighting of any form is prohibited, other than security lighting provided by the city. Balloons must be removed 24 hours from time of placement. The consumption of malt beverages and intoxicating liquors is prohibited in the Cemetery. Flowers, trees, bushes, and shrubs are to be planted only by authority and under the direction of The Parks and Grounds Board. A slant-faced or double marker must have a foundation two feet in depth, or less at the Supervisor’s discretion. In Block C, slant-faces markers or smaller are allowed. American flags will be placed on veterans graves before Memorial Day and will be removed the week after Labor Day, or sooner if discolored. April is cemetery clean-up time. All winter decorations, wreaths, wire stands must be removed by owner by April 15 or items will be removed by cemetery personnel. Monument salesmen must contact the Parks & Grounds Supervisor or assistant to obtain a permit before placing footings at gravesides. No placing of monuments, stones or footings after hours or on weekends. Only funeral home markers are permissible in “Baby Heaven” (Oakdale section). Use a coffee can and cement to anchor marker. Children are not permitted to enter the Cemetery unless accompanied by a responsible person. Casket floral sprays and wreaths may remain two weeks after a burial. The Cemetery will be “Closed” from 10:00 p.m. to 7:00 a.m. daily. No vault trucks allowed off blacktop. The grave must be dug five and one-half feet deep. The footings for large stones or monuments must have a depth of no less than four feet. All graves sold in the Cemetery shall be subject to the restriction that no owner may transfer such grave (except by devolution to heirs) with profitable consideration. The Cemetery reserves the right to re-purchase the grave at the original price. The Parks and Grounds Board shall provide for the perpetual care of all burial lots and shall employ a caretaker who shall keep all grass mowed, collect all trash or rubbish, and perform such other duties as the Parks and Grounds Board shall deem necessary to the general appearance and the operation of the Cemetery. The cost of perpetual care is included in the price of the plots. Maintenance costs of all monuments shall be the sole responsibility of the grave owner or remaining direct relatives. Memorial Section: All “odd” numbered rows will allow for above ground monuments or markers that will fit within the dimensions of the monument aisles. All “even” numbered rows will allow for flush markers only. Baby Heaven and cremation sections must have flush markers also. Any person who shall destroy, mutilate or remove any monument, gravestone, building or other structure placed in the cemetery, or who shall destroy or injure any tree or shrub or who shall be found guilty of the theft of any plant, flower or other decoration from any cemetery grave other than his/her, own shall pay a fine of not less than $100 nor more than $500 for each offense. Cremains require minimum hard plastic container. Openings will be done 24 hours prior to the time of service, or at the discretion of the Parks & Grounds Supervisor. These rules and regulations shall take effect and be in force upon passage. All previous rules and regulations relating to the operation of the Richland Center Cemetery are hereby repealed. Adopted this 8th day of December, 2003.